A flurry of snowfall is often a breathtaking view. Snow-capped evergreens are a joy to see. The ice-cold temperatures offer a much-needed break from summer’s heat. However, these very same winter joys can bring devastation to your home, if protections are not in place. 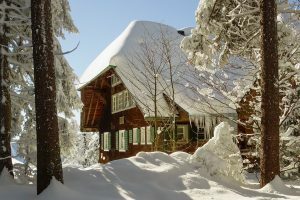 Homeowners who live in high-snowfall areas and locations subject to winter’s subfreezing temperatures benefit from addressing common problems that often occur when winter descends upon us with its chilling winds and dense snowfalls. Heavy snow is excellent for winter activities, like snowboarding or sledding. When snow gathers on your roof, the outcome is not nearly as delightful. How can a pile of snow impact your home? Dry snow or light accumulations are nearly harmless. Heavy snow, in all its natural wonder, can wreak havoc to a home’s roof. When snow accumulations of four inches or more occur within a 12-hour timespan, it’s considered heavy snow. Most rooftops are able to handle 20 pounds per square foot of snow before becoming stressed. Flat roofs and roofs that hang over porches are especially vulnerable to collapsing under piles of substantial snow. Homeowners can brush away the piles of weighty rooftop snow with a roof rake. These convenient rakes with long handles are especially useful in removing snow from roofs while remaining steadfast and safe on the ground. Be careful to not climb onto the roof to remove the snow. You can do accidental damage to both the roof and yourself! A second option to remove snow from a rooftop after a big storm is to hire a contractor. Homeowners are advised to be prepared with the contact information of local contractors way ahead of winter. For roof repair services in North Chicago suburbs call Reliable Roofing. Perform regular inspections of your home’s gutters. Clear away any natural debris, like leaves and twigs. A gutter and its downspouts need to be clear so water has no way of backing up and freezing. Also, make sure the downspouts divert water away from your property. 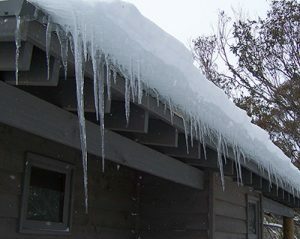 In addition, blocked gutters can form destructive ice blocks. The weight of the ice along the gutter paths can yank the entire gutter line off your home. Low, overhanging branches are likely to break during winter storms, when the weight of the snow and ice heaves the branches below. Heavy, falling tree branches can damage your roof or other parts of your home. Power lines are also susceptible to damage if tree branches are left unmaintained and tumble below as a result of snowstorms. Protect your home from winter storms by trimming all tree branches that surround your home. Homeowners can be proactive by pruning all dead, broken and weakened branches as soon as they are spotted. The branches of soft-wooded trees, like oak and ash, are most susceptible to breaking off in winter storms. However, any tree that surrounds your home should be carefully evaluated for pruning prior to the winter season. Experts recommend avoiding pruning in the fall, a season that stimulates rapid tree growth. In fact, regularly maintaining the trees around your home throughout the year is safest. Another option for homeowners is to contact a tree trimmer or certified arborist for professional pruning. This will protect your home from falling branches in any season. The exterior walls of your home, attics and crawl spaces feature water pipes that supply water to your faucets. When pipes in uninsulated areas like these freeze, a pipe break is the likely result. Protect your home from water damage due to ruptured pipes by ensuring water pipes in icy areas are insulated with a pipe sleeve or a similar insulation, like a quarter-inch of newspaper. In unheated areas, such as under the kitchen or bathroom sink, keep the cabinetry open to allow warm air from the rest of your home to circulate. Homeowners can also drip water from a faucet during frigid storms to help keep the water pipes from freezing. Ice dams form when escaping heat from a home melts ice along the rooftop, allowing it to drip to the edges and refreeze. Leaky roofs and damaged walls or ceilings result from ice dams. Icicles hanging off the roof, no matter how exquisite, signal the presence of dangerous ice dams. The optimum protection against the formation of ice dams is insulation. Seal any gaps from light fixtures to keep warm air from rising into your attic. Also insulate the attic itself to prevent heat from escaping to the roof. Experts suggest keeping the attic temperatures no greater than 5 to 10 degrees warmer than the outside air. When winter sets in, storm damage is a possibility. Winter storms are often accompanied by water damage. Frozen pipes that burst during arctic temperatures can lead to extensive water damage in your home. Heavy snow piles on a roof can cause it to collapse, leaving ceilings and walls vulnerable to moisture. Ice dams are just as likely to be the source of unwanted water seepage into your home. Homeowners can be careful, but when disaster strikes, call our professionals at ServiceMaster DAK for water damage restoration. Our skilled technicians can thoroughly dry a water damaged space and restore your property to its original condition using advanced water extraction techniques and equipment. We will even work with your insurance company when it comes to filing claims. Winter water damage is irksome. Mold growth and structural damage, like warping, floor separation and discoloration, can occur within hours. No matter what the cause of winter water damage to your home, our professionals are available to effectively evaluate the situation and quickly repair the damage. When you have a water damage emergency, contact the water damage restoration professionals of ServiceMaster DAK immediately to prevent continual damage to your home’s building structure. We are on call 24 hours a day, 7 days a week to provide emergency services in the North Shore and northwest Chicago suburbs.